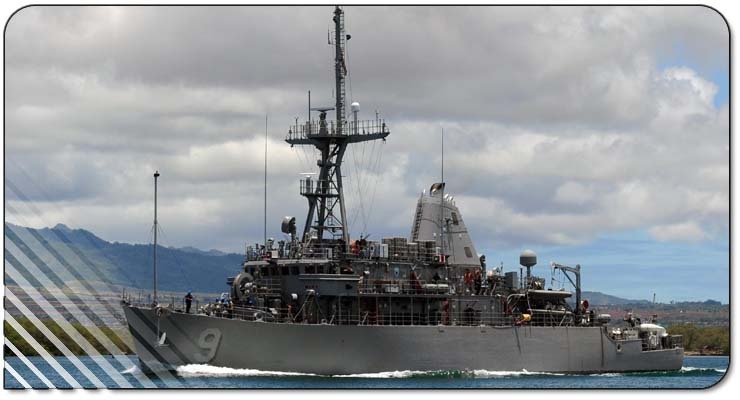 The mission of the PIONEER (MCM 9) is to clear the ocean bottom and water volume of anti-ship mines. A combination of stealth, endurance, and the latest mine countermeasures technology allows the PIONEER to conduct sustained, full-spectrum, mine countermeasures operations in the world’s critical maritime regions. Specific advantages and capabilities include the ship’s low magnetic signature diesel engines and wooden hull, which reduce the ship’s vulnerability to magnetic-influence mines; a precise navigation system, which allows the ship to find, plot, and report suspected mines with great accuracy; a high frequency sonar, used to locate and classify mines; three minesweeping systems (mechanical, acoustic, magnetic), used to destroy mines; two rigid hulled inflatable boats (RHIBs), used to carry divers and mark suspected mines; and a remotely controlled mine neutralization system used to identify suspected mines and destroy them with explosive charges. A product of intense research and unique construction, the PIONEER plays a vital role in America’s enduring objective to maintain uninterrupted access to the world’s strategic waterways. Seal:The coat of arms as blazoned in full color on a white ellipse pointed at the top and bottom edges. The seal is enclosed by a white designation band with black edges. On the left-hand side is incscribed "USS PIONEER" in black letters. 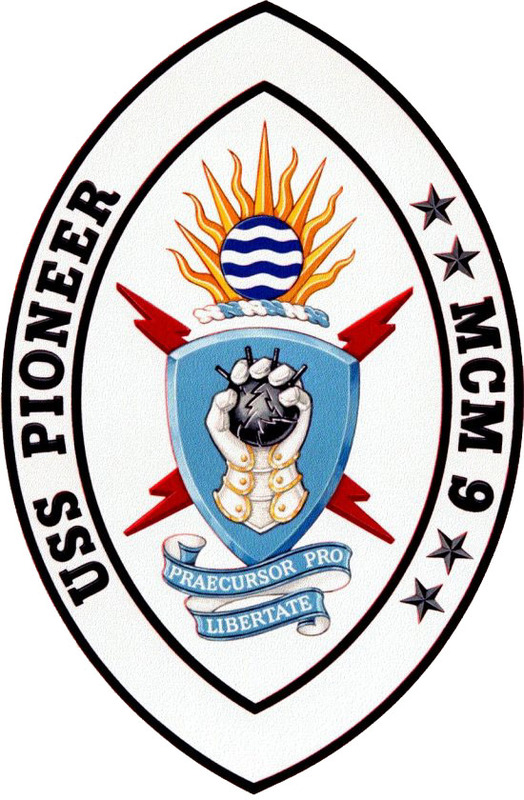 On the right-hand side is inscribed "MCM 9" in black letters, surrounded by two silver stars on each side. The Shield: Blue represents the sea and dedication to duty. The sinister, or left-handed, gauntlet grasping a cracked mine symbolizes PIONEER's primary mission of destroying sea mines. The Crest: The sun rays allude to excellence, life, and safety. The heraldic fountain signifies peaceful seas. Supporters: The lightning bolts, crossed to emphasize strength, underscore PIONEER's electronic technology. Red denotes courage, zeal, and action.